Another great Weninger wine from the time I did not know them, thus never really got to taste it in full fame & glory. Now on a 50% sale at In Vino Veritas, probably slightly past its best, but still with a good chance to show some skin. I did love the 2000 & 2002 vintage last year here. This wine looks definitely older, and has a garnet hue with a pale rim. Pretty simple at the start, but develops a nice bouquet after a few hours in the bottle. A mature nose of leather & tobacco, with some black cherries. Some dark chocolate appears, with a touch of that interesting, slightly vegetal note that made the 2000 so exciting. Black cherries on the palate, with some chocolate. Nice acidity, with a considerable amount of smooth tannins. The warmer it gets, the heavier it seems to be due to a 14% alcohol. At first it looked pretty lean compared to my memories of the 2000 & 2002 vintages. Anyway, it is a great wine from a not-so-great vintage. A classic in Hungary, while possibly a bit shy of being an unquestionable classic on the international scene. Lots of Bordelaise wines are gone by now from the poor year of 2001, only the top ones are performing still. This one is tirinig, but definitely on the chase. 89 points with me & a buy at half price for 3200 HUF or ca. 12 EUR. Drink it soon, do not lay further. Or rather 10 EUR, that is, as some goddamn politician is unable to keep his (not-yet-)bloody mouth shut again. 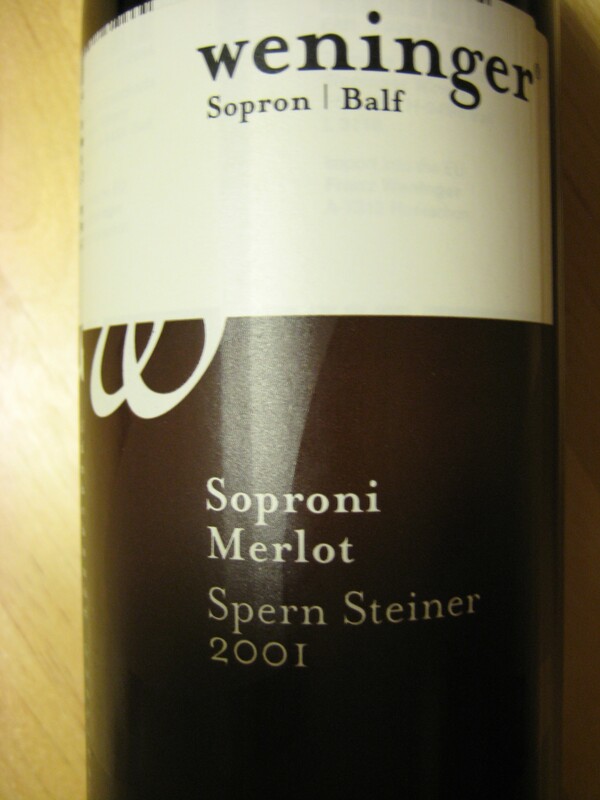 This entry was posted in Red Wines and tagged 2001, merlot, sopron, weninger. Bookmark the permalink.